At first glance, Michael Cooper radiates quintessential biker Veteran. 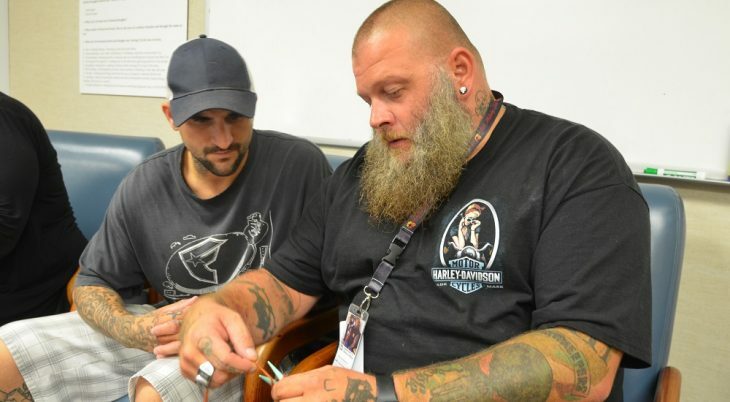 Cooper’s light-hearted approach is typical of the knitting group which meets weekly at the Milwaukee VA Medical Center domiciliary, a residential program that offers treatment for a wide range of issues. The knitting elective was started about 2 ½ years ago, said Julie Jackson, a psychologist who instructs the group, along with Angelina Nanette Schmidt, a program support assistant. Cooper said knitting helps him cope with his PTSD. Dimitris Hurst, a 60-year-old Army Veteran, was in his second week of the class, getting instruction from Briana Johnson, a social worker who also helps out weekly. Nate Koch, a 39-year-old Marine Corps Veteran, has only been knitting since he joined the group about a month ago. But, he doesn’t miss a stitch on the blanket he’s working on, simultaneously carrying on a conversation over an indie rock playlist audible in the background. The group averages about 10 per week and has been full almost every week since it started, but new participants are always welcome, Jackson said. Some of the Veterans buy their own yarn and some is provided, she said. On this day Jackson was surprised by a room full of balloons and cake to recognize a recent ribbon for her knitted socks entry at the Wisconsin State Fair. Encouragement and one-liners punctuate the free-flowing group conversation and blend with the click, click, click of the knitting needles. Jackson’s out-loud observation, “Charles just finished his first row,” drew a round of applause. And that, Cooper said, is what the group is all about. 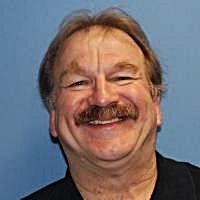 Jim Hoehn is the Public Affairs Specialist at the Milwaukee VA Medical Center. I manage several veteran pages and I need to be able to share your pages to other vets that may have use of your information. How is that done? Thank you. This is the perfect humans! And this is REAL: You kind of put your passion into it.